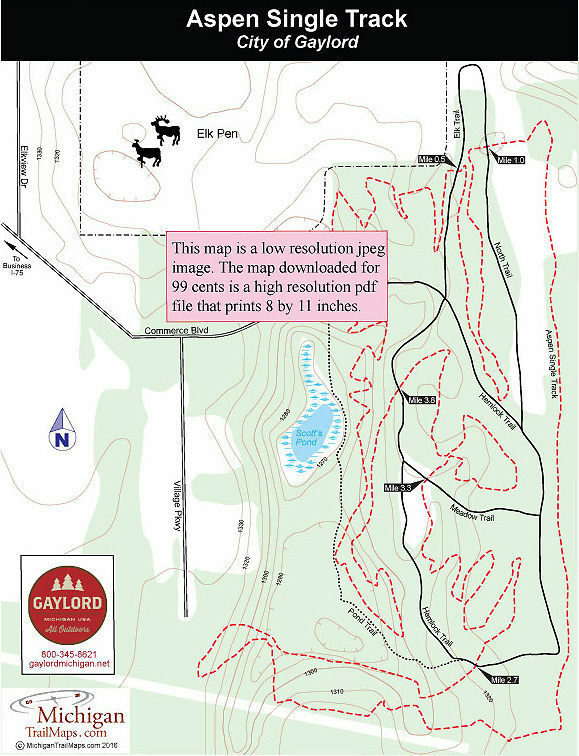 Built by the Northern Chapter of the Michigan Mountain Bike Association (MMBA), this 5-mile loop has become a favorite with locals looking for a quick workout and vacationing mountain bikers in need of a leg stretcher in the middle of a long drive up north. Like everything else in Gaylord, Aspen Park is an easy-off-easy-on sidetrip from I-75. In less than five minutes after leaving the interstate, you're on a single track, riding through the woods past huge hemlocks. Aspen Single Track dates back began in 2001 when the Northern Chapter received permission from city officials to cut the trail. Chapter president Eric Isaacsen and vice president Bill Snow then spent the winter exploring the area on snowshoes to get a feel for the topography and lay out the trail. In June of 2002, the new single track was completed. 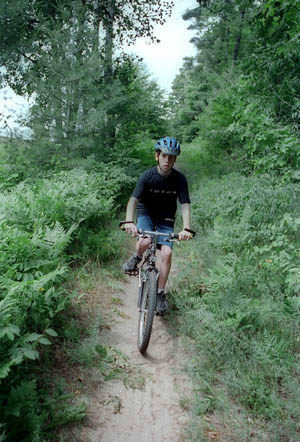 The pair initially wanted to make the single track a beginner to intermediate ride but because of the topography the trail is more intermediate with some technical aspects to it. In the beginning much of it is still relatively flat, featuring fast sections through stands of red pine. In the second half of the ride you do encounter some twisty switchbacks and some surprisingly large hills for a municipal park. The single track is posted along Commerce Boulevard just before reaching the parking area and is followed in a clockwise direction. The first leg is a narrow single track that winds through a heavily wooded area with numerous short climbs and off-camber turns that keep you shifting gears. You pop out at the park’s paved trail at Mile 0.5 and then again at Mile 1. A quarter mile later you’re speeding through an open meadow and then do the same in a red pine plantation where you can race through the perfect rows of trees. After swinging within view of a home the trail dips back into the woods and gets far more interesting when you encounter two large hills, the first just before Mile 2. Both are marked with yellow “Caution!” signs while in between them you bottom out in a wooded ravine that looks like it belongs in the Pigeon River Country State Forest not in the middle of Gaylord. This is the southern end of the loop and considering how flat the rest of the city is, the climbs and rocket descents you are encountering now can be a bit shocking. You cross the paved trail at Mile 2.7 to a fairly easy and level stretch of the trail and then pop out at asphalt again at Mile 3.3 and Mile 3.8. The final mile of the trail is the most technical aspect of the loop. You weave up and down through the red pine and large hemlocks that forest the hillside above the Scott's Pond. At Mile 4.25 you pop out at Pond Trail, an old 2-track, and then climb back up the hill for a good view of the pond and wetlands that surround it. At times this section can be a bit confusing but eventually you find yourself skirting the parking area from below before ending at the large green gate that prevents motorized activity on Pond Trail.